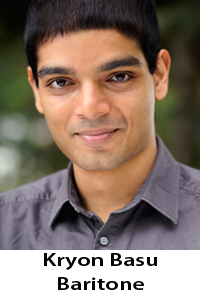 Kyron Basu is a versatile baritone with a repertoire ranging from Bach to Berio. An enthusiastic performer, Kyron has appeared as a soloist with groups such as Fretwork, the Victoria Baroque, Victoria Philharmonic Choir, and Victoria Children’s Choir. Upcoming engagements include the role of Christus in Bach’s St. Matthew Passion with the Victoria Philharmonic Choir, and Schubert’s Mass in G with the Linden Singers. Kyron is currently pursuing his Masters in Musicology with Performance at the University of Victoria, in the studio of Benjamin Butterfield. Kyron is a member of the voice faculty at the Victoria Conservatory of Music, where he teaches voice and lyric diction.